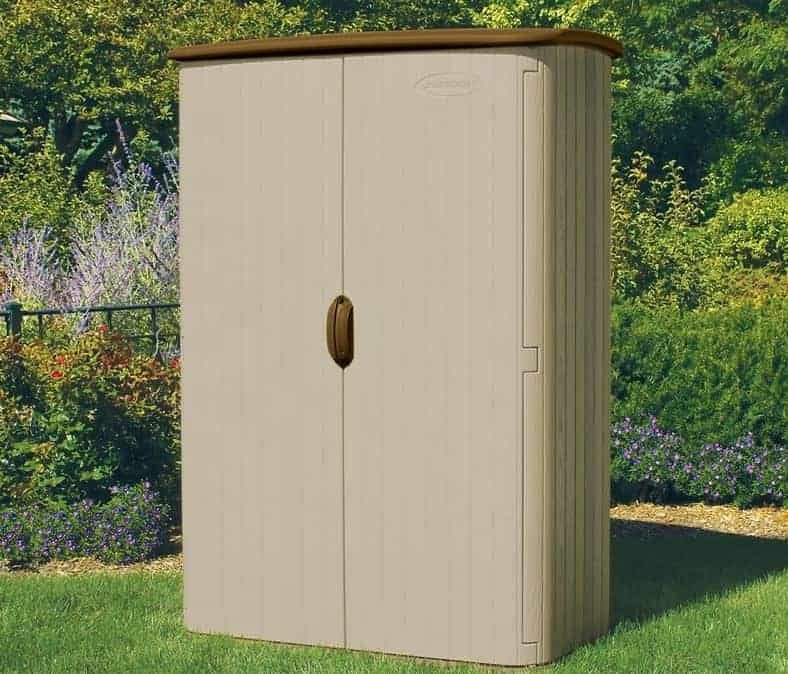 The 5 X 3 Suncast Resin Conniston Four Vertical Shed would easily blend into any garden and provide a perfect amount of storage for all those garden tools and items you have lying around. Offering a generous amount of storage space, but doing it in style, make this a shed that is just so incredibly practical and easy to like. It is impossible not to be impressed with the look of the shed as it does have a high quality and modern style which makes it stand out. Suncast have put a lot of work in to make sure that this is a shed that is every bit as long lasting and strong as it is pleasant to look at. Being made with top of the line resin and manufactured with the latest blow moulded technology, this a shed that is strong, but also a shed that is very low maintenance when it comes to keeping it looking good over the years. The shed has a roof that has been cleverly designed to make it so no rain gets inside or runs down the walls and also has a sturdy floor. From the top to the bottom this is one impressive, well made and great priced storage shed. 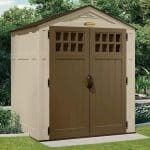 This vertical style storage shed from Suncast is exactly what you folks who have been in the market for a solid, strong and reliable storage shed have been looking for. The design of the shed has been cleverly crafted so that it can easily blend into any style of garden and look great doing so. It offers a good amount of space inside with, a depth of 2 feet and a width of 4 feet 2 inches. The height is 6 feet 7 inches which we feel is just perfect for a shed of this style. These dimensions mean that storing your rakes, hoes, shovels and other such gardening items is going to be easy and also done in some style. 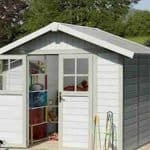 We feel that this shed really does offer that ideal amount of storage space for all your tools and equipment that you use to keep your garden looking great. For the roof Suncast have made sure to not only make it so this is reliable, but also that it fits in well with the design of the rest of the shed. The roof is made from some top of the line resin which is more than capable of fighting off the bad weather during the winter months and also having a little bit of sparkle about it during the summer. The roof sticks out a little bit on each side of the shed which at first glance may look like nothing more than a cosmetic choice, but actually this is a very clever way to ensure that the water will always run away from the shed and never down it. Add to this the fact that the roof is not flat and you have a roof that will never allow rain to sit on top of it. Interestingly the Suncast Resin Conniston Four Vertical Shed does not have what we would call traditional cladding. Instead the walls are made from this very impressive resin that has been made using the very latest, blow moulded technology and is a solid, 38 mm thick. First of all this gives the shed a very unique and interesting look that really does set it apart from other sheds. Secondly, it also manages to keep the cost of the shed down while at the same time offering a very strong and resistant protection against the weather and anything the kids or pets can throw at it. We love this kind of resin, largely because of just how durable it is, but there is no escaping the fact that with its, sandy, brown colour it also looks the part. Not only does the shed look great, but it also has this lovely, wood grain type of feel to it as well. A big feature of the shed that Suncast are proud of is something that is called Stay Dry Design and what this does is ensure the shed will not rot, even when it has been out in the garden for years. A huge plus of a shed that is made with materials like this is that really there is no need for a frame. You see this shed will easily slot together and once it is all in place the actual shed provides an incredibly surprising strong and durable structure that will stand for many years. So while this may lack what we would traditionally class as a frame, we feel what Suncast are offering here, still makes for a very strong shed. 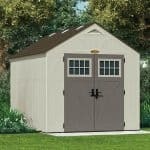 This is the type of shed that you use to store mainly your more basic types of gardening items and tools and Suncast have used a floor in accordance with this. The flooring is made from UV Stable Plastic Resin, a very durable material with a little bit of give to it so it can take far more weight than you would actually think. It is also perfect when it comes to protecting against the rain as if you do have the doors open to perhaps put something inside or take something out when it is raining you can easily get a mop and just wipe all the water off it. This type of flooring does its job just so well that you do not even really notice it after a while. Another huge plus about Suncast using plastic resin for this shed is that it is just so easy to maintain. There is no need to treat the shed with any kind of paint. All you need to do is wipe the shed down to keep it nice and clean which again, thanks to the material, is easy to do. A wet cloth, bucket of water, small bit of elbow grease and about five minutes of your time is all that is required to keep the shed looking good. One thing that we really love about Suncast is that they take such amazing pride in their sheds and believe in the materials they use, they are willing to offer a five year guarantee. We think this is incredible and it will cover you against any natural wear and tear on the shed over those first five years. We know the pain and frustration that can come from trying to get items into a shed that has a small door. We are very pleased to tell you that the doors used here are a fantastic size. This double door is almost as wide as the entire front of the shed. When the doors are open, you have 1208 mm in width along with 1880 mm in height. Getting a shovel or a rake out is not going to require any twisting or turning at all. The doors can open independently as well which is great for when you just need to grab something quickly. Two large door handles make it no problems at all to open the doors and they are finished in a brown colour which compliments the rest of the shed very well. There are no windows on the Suncast Resin Conniston Four Vertical Shed which at first may sound like something that would be a thumbs down, but actually this is a storage shed first and foremost so we feel that the lack of windows does not affect the overall design or practicality of the shed. 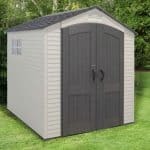 This is a good, strong shed that will certainly keep all of your gardening tools safe, dry and away from people you do not want touching them. The double doors close very tightly and if you do want to add a little bit more security then Suncast have actually left a space where you can attach a padlock to the shed. When the shed is all closed up then no one is seeing inside. You really do get the most privacy possible with this and that is something we are sure some of your will love. 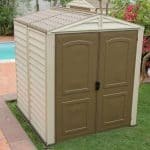 This shed comes in its default sandy brown type of colour and from the outside there does not appear any way to make changes to the shed. However, inside you do have a bit of freedom and you can easily add a few shelves to the inside if you want to give you that little bit more storage space. Using this kind of resin was not just done to keep the costs down, it was used because of how high quality and long lasting it is. The materials the shed is made from are just so durable and able to withstand whatever the weather throws at it over over the years that even with just a little bit of care on your part, you will have a shed that will last many years. 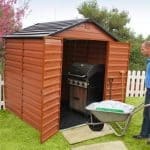 This is a shed that is designed to keep your gardening items and tools safe, secure and tidy. We feel the storage space provided does this and if you place things inside properly, you have an ideal amount of space. No tools are required to build this which is great. Even those of you who consider yourselves to be a novice at DIY will be able to slot this together easily and without any hassle. We feel that the materials used and the modern look they provide make this excellent value for money for those of you looking to store your gardening items in a more organised manner. Final Thoughts: We were very impressed with the Suncast Resin Conniston Four Vertical Shed. The look is just so unique and modern that it is really easy to be wowed by it. Offering just a perfect amount of storage space for a shed of this type and being made with some extra tough resin and constructed via, blow moulding makes it just such a great deal. At not much over £300, we think that as a place to keep all your rakes, shovels, brushes and other such items off the floor and organised, this really is a great, solid shed and something that we have no trouble recommending to you at all.